Power transformers are vital components in a transmission system. The work to keep this equipment in dependable operating conditions depends a lot of its system to measure oil and winding temperature. It is known that high temperatures cause accelerated aging of the transformers and their inaccurate measurement limits transformer loading. However, so far, the application of digital temperature monitoring systems was strongly limited by the absence of reliability in the application of electronic devices directly in the big transformers, in general due to many cases of triggering with error and even failure in its electronic circuits. 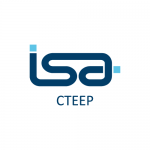 In this paper we present the solution based on modernization of the thermal protection, applying a micro-controlled of digital measurement system of the oil temperature of the oil and power transformer winding at the CTEEP. With the modernization of the transformer thermal protection, it was to save in maintenance costs and improve the loading control of the transformer. 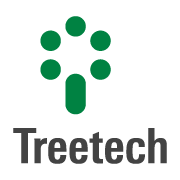 The experience showed the feasibility of applying the digital technology in the existing and new transformers and helped to establish the minimum characteristics that these digital temperature measuring systems must have so they maintain the reliability level of the power transformers of the company. Power transformers are the most important pieces of equipment in a substation, and its construction takes into consideration a life expectancy of 40 years. The accessories connected to it do not always have the same longevity. This is why the maintenance process is a concern, so that it increases transformer operating reliability, and extends transformer service life, resulting, at the same time, in savings in the in the maintenance costs and in a shorter equipment downtime, which makes it a valuable activity in the substation asset management. And part of the work of maintenance team is to ensure that the accessories of the transformer continue working as they should, with measurement accuracy, or are kept in a condition of alarm and triggering that is reliable. 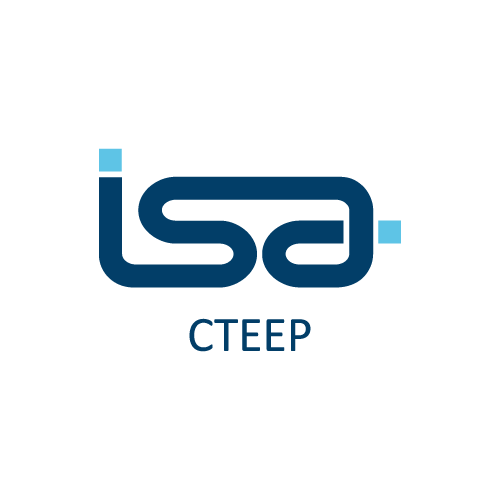 This work will present the solution that was adopted to make the monitoring of the power transformer park temperature at CTEEP feasible. It has an installed capacity of 43,223 MVA and an infrastructure formed by 12,249 transmission line km, 105 substations and over 500 550kV power transformers. The results of the modernization work of the thermal protection of power transformers replacing mechanical thermometers with a micro-controlled digital system to measure the temperature of the oil and winding and control the cooling system in the company transformers. The most important components in the transformers are iron, copper, insulating oil and insulating materials. Of these, the most fragile one is the insulating material. The main component of the several solid insulating materials used in high voltage transformers immersed in insulating liquid is cellulose. Among the solid insulating materials, the most commonly used one is paper. Cellulose is an organic compound, with a molecule made of a long chain of glucose rings, or monomers. Each molecule of cellulose, when it is new, has from 1000 to 1400 glucose rings, connected to each other, as shown in Figure 1. Extreme heat leads to cellulose fiber carbonization. However, moderate heat as normally happens in transformers, causes the individual monomers to break into the cellulose chain, forming a solid residue and liberating carbon dioxide and water. The degree of polymerization, as expected, is reduced, diminishing the mechanical resistance characteristics of cellulose. As in a transformer, temperature is not distributed in an uniform way; in general, the analyses of heat effect on the deterioration of the cellulose must take into consideration the temperature of the hot spot, because this is the place where the greatest degradation will take place. After knowing how temperature acts on the insulating material applied in the transformers, we will see how transformer temperature control is done.. 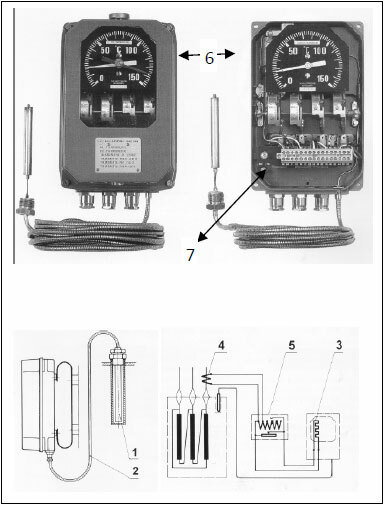 Thermal protection of the transformers was done with analog thermometers, as the ones shown in Figure 2. Those devices are usually waterproof rugged boxes, covered with glass, with its mechanical hands adjusted to command fans and alarm and protection functions. These devices are essential for the safe determination of the transformer load and its protection in overload situations, when temperature can reach values that affect the service life of the transformer or even cause severe damage to it. Nevertheless, its importance has been observed in the transformer park of the company: a great number of failures in these pieces of equipment. Oil thermometers like those in Figure 3 measure the top oil temperature directly through a system consisting of probe, capillary and dial with hands. The probe in contact with the transformer top oil causes the expansive liquid inside the probe suffer an expansion that move the meter and trigger hands of the adjustable micro-switches. With the increase in temperatures, the hands reach the set points to turn on the fans, issue alarms and shut down the transformer. Due to the high voltage levels at the transformer winding that prevent installation of measurement probes directly on the windings, the winding temperature is measured through by thermal imaging, in a process of direct inference of the temperature through the oil temperature and the transformer’s load current. In addition to a unit that is similar to the one used to indicate the temperature of the oil, the winding temperature measurement unit has an extra device. A heating resistance coupled to a thermowell and connected to the current transformer. The CT current will generate bulb overheating and of the probe in relation to top oil temperature corresponding to transformer loading, that will move the expandable liquid through the capillary, producing one indication corresponding to the winding temperature. a) The indicators lose the precision as the years go by and need more constant periodic calibrations. b) The precision depends on the ability of the technician that makes the adjustments. c) In some equipment water or moisture penetration are observed. d) Corrosion of contacts and internal metallic parts. e) Alarms and erroneous triggers caused by old thermometers with mercury ampoule. f) The capillaries in the older equipment had a constriction caused by previous maintenances in the transformer. That made the real temperature be much lower. g) Calibration process was difficult and took a long time. h) Replacement parts were not found in the market. I) High maintenance costs, because the equipment was imported. J) Without alarm or (self- diagnosis). k) Some had self-imaging components inside the transformer, making the maintenance difficult. A market research showed some possible solutions for the problems in the system of thermal protection applied in the company. A new category of equipment known as IEDs (Intelligent Electronic Devices), forming an autonomous system able to do measurements and issue alarms, without computers or associated special software, specifically developed for the high voltage substation environment, according to the technical standards. The minimum characteristics for that equipment were, then, defined with the Maintenance Engineering and Automation areas. The working principle should be based on the top oil temperature measurement, done by means of by means of RTD temperature sensors of the Pt100 ohms type at 0º C, and the temperature of the windings should be determined through calculations based on mathematical models of the thermal behavior of the windings and no thermal imaging processes would be accepted based on heating resistance. For this, the monitor should also receive current information from the transformer’s load current, through the bushing CTs specified for this purpose. The RTD temperature sensors should consist of sensors of the thermo resistance Pt to 0° C class B type, with characteristics according to the DIN-IEC 751/85 standard. Resistance to vibrations – IEC60255-21-1. Monitors should constitute a decentralized and modular system, which can be extended with the addition of another independent temperature monitor for winding temperature indication for medium (or low) tension and of the tertiary winding (if any). That allowed the equipment to be applied in different transformer configurations. Additional to that, a reciprocal supervision should exist between the temperature monitors via interconnection of their serial RS485 ports so that a failure in one of the temperature monitors be indicated by the other. That increases the safety of the thermal supervision of the transformer. 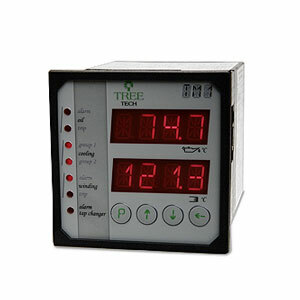 The temperature monitor should allow installation in a way that does not interrupt the CT circuit and does not disconnect the transformer. For that, the measurement of the CT bushing current should be done through CTs with a window core of the pincer type for the installation of the cable through which the secondary bushing CT current circulates. A current range of 0-10A was requested, that the user himself could change, once there were multirelational bushing CT’s, especially 1A, 1.5A. Another characteristic that allowed a greater exchangeability between the temperature monitors was the universal supply voltage input in the 38-265 VDC or VAC range, 50 or 60Hz. The equipment would have to withstand a wide range of operating temperature -40 through + 85º C with the presence of moisture. Even if the average temperature in the State of São Paulo were around 23ºC, the temperatures closer to the body of the transformer or inside the control cabinet can reach three or four times the average values. This wide temperature range indicates a ruggedness feature of the equipment. For the visualization of the measured temperatures LED type displays were the preferred ones (Light Emitter Diode), instead of the LCD type (Liquid Crystal). This is to guarantee an easy visualization of the temperature even from a distance. In the same way as analog thermometers, the monitors should have the records of the highest temperatures reached since the last time the recording has been restarted. In order to increase safety the equipment would have the possibility of temperature redundant measurement of the top oil through two RTD temperature sensors of the Pt100 type, with possibility of connection of the RTD sensors connected with 4 or 3 wires, with compensation of the resistance of the connection cables of the temperature detector(s). In addition to that, the safety was reinforced with an alert function in case the temperature sensor or the cables that connect the sensor with the monitor break, with display signals, activating the alarm contacts, for diagnostic-contact activation and preventive cooling actions, so that excessive transformer heating is avoided. A minimum of two analog outputs has been applied on current loop: 0 … 1 mA, 0 … 5mA, 0 … 10mA, 0 … 20mA ou 4 … 20mA, chosen by the user. These exits are incorporated in the transducers needed for the SCADA system. 2 Normally Open Contacts for oil temperature and double safety activation windings trigger disconnection. (simultaneous order for two micro-controllers for operation). 2 Normally Closed Contacts to activate the two forced cooling groups, with a timed activation of the motors even when there is no supply. a) An accuracy of 5% at the end of the scale with a deviation through the variation of the ambient temperature under 20 ppm/°C and display resolution of 0.1ºC. That is much superior to mechanical thermometer accuracy. b) Cooling operation selectable through frontal panel either automatically or manually with an automatic inversion option following the working order of the two forced cooling groups. With that the key that was used for this function was eliminated from the control cabinet and also the key for the inversion of the cooling groups. The automation of this function released maintenance personnel from the task of maneuvering this switch weekly. c) Fan Function exercise, to predict mechanical problems, with hours selectable by the user. d) Pre-cooling function with two load levels programmed by the user, connecting the cooling system through the load and not only through temperature, to extend the service life of transformer insulation, when subject to an overload. e)Self-calibration system to guarantee the accuracy of the temperature monitor. Neither monitor parametrization nor calibration is accepted anymore, with the use of any mechanical part (potentionmeters, trimpots, dip-switches, etc.) it is verified that those components undergo degradation through temperature, moisture and vibration. f) The use of open and selectable open communication protocol by the user between Modbus RTU and DNP3.0 has been useful in the company automation processes. DNP 3.0 protocol would have Time-Stamp support with an accuracy of 1ms. g) A NF self-diagnostic output contact (including watchdog timer) for absent supply or internal failure, with failure indication on the display and transformer shutdown signal blocking. h) Non-volatile FIFO Mass Memory to record temperature measurements and alarm events, regardless of the computers. A simple software allows data to be downloaded to a computer. i) Real time clock with date and time, which keeps adjusted if there is an auxiliary power supply outage, for at least 48 hours. The use of batteries was not accepted to keep the clock working in the absence of auxiliary power supply so that the equipment is completely free from any periodic maintenance. The installation of the first equipment, known as Temperature Monitors, with the same described characteristics, were installed in the substation of Araraquara in a 300 MVA transformer bank, – 440/138 kV, manufactured by Siemens. Equipment installed in 2001 already have operated for nine years in a satisfactory way, integrated to the substation’s supervision and control system. During the installation, the small size of the equipment was also noticed. During the maneuvers and normal operation of the transformers, temperature monitors showed ruggedness in relation to electromagnetic interferences and also to the high temperatures recorded in the region. with accessories (Figure 4) 1 oil thermometer and accessories. 1 winding thermometer and accessories. 1 Reversion key of the cooling groups. Self-Calibrating Equipment By recommendation of the manufacturer, the calibration should be done every year. Result:An economy of around 1 million reais, should be the result of suppressing this work for 10 years. 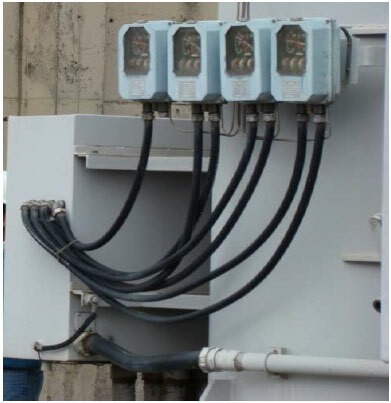 After the new temperature monitoring system was installed, no more undue triggers in the transformers caused by thermal protection were recorded. This has extended safety. However, some transformers do not have the disconnection contact application yet. Analog outputs which are configurable in several current loop options, together with serial communication ports with DNP 3.0 and Modbus protocol options, selectable on the frontal panel, were essential for the integration of the oil, winding and cooling control information integration in the control center. 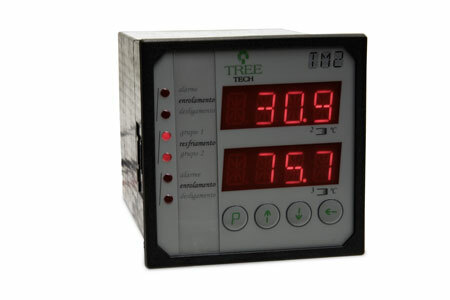 The chosen temperature monitor would also have, through the serial communication ports, the integration capability with the online monitoring and diagnosis online system developed by the company. The result of the modernization of transformer thermal protection was positive when we observe the benefits for the company, such as the economy in the maintenance process of the transformers, the increase of the reliability, and facilitation in the integration process with the company’s SCADA system. With this reliable measuring system, the operation of the transformers becomes more optimized, thus reducing the risk of loading the transformers over the values proposed for oil and winding according to the standards. According to the results obtained, the company is advancing in the process of modernization of transformer thermal protection. Another action was to incorporate in the specifications of the new transformers and in the factory changes the minimum characteristics for the microprocessed oil and winding temperature monitoring system. Therefore, the new transformers already arrive with this new technology, thus protecting and increasing transformer service life.